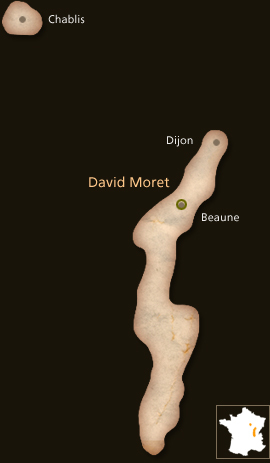 David Moret studied Viticulture and Oenology at school. Unfortunately, he did not have a family domaine to work at once he graduated. He then entered the wine trade by selling winery equipment to local vignerons, during which he developed close friendships with many of the top growers in the Côte de Beaune. This has allowed David to start his own label in 2000. One of the new micro-négociants, he is working with many of the growers he has come to know. Since then, he has continued to buy small parcels of grapes from the top growers of Meursault to press and ferment in his cellar, always sourced from the same plots of vines. Les Charmes, Les Genevrières and Les Perrières are the finest of Meursault’s 17 Premiers Crus, and many regard ‘Les Perrières’ to be the best vineyard in Meursault, with the power and structure to rival many a Grand Cru from the Côte de Beaune. 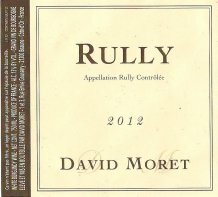 He has expanded his production to include Corton-Charlemagne, Puligny-Montrachet, Saint Roman, and Rully. He uses a maximum of 40% new oak to allow the elegance and minerality of the wines to shine through, as well as highlight the quality of the plots from which he sources his grapes. Pale golden in appearance. The nose is full with a varying bouquet of flavors; elderberry, lemon, white peach and hints of flint. The palate strikes the characteristically Burgundian balance between acidity and richness, with bright fruit, nuts, oatmeal and notes of honey, a rounded palate and a long finish. Grapes were brought straight to the winery and were pressed immediately via an air press, to preserve the precious Chardonnay aromas and flavors. The wine went through alcoholic and malolactic fermentation in French oak barrels, then ageing for a total of 15 months, before being bottled and resting in the cellars for approximately six months. Sourced from the northern most village in the Côte Chalonnaise. Here David shows what proper winemaking is. Knocks many other negociant Meursault into a cocked hat with its ripeness and balancing, preserved lemon acidity. Somewhat under the radar at En Primeur time as styled to drink but already has a keen following amongst those in the know. Limited stocks. Pale golden reflections in the glass. Lemon aromas and buttery characteristics. On the palate, balanced acidity and a mineral touch round off the citrus flavors before a lingering finish. Grapes were brought straight to the winery and were pressed immediately, to preserve the precious Chardonnay aromas and flavors. The wine went through alcoholic and malolactic fermentation in French oak barrels, then ageing for a total of just over 12 months, before being bottled and resting in the cellars for approximately six months. David only used 25% new French oak, to ensure that the fine character of his wine shines through. The vineyards of Saint Romain are mainly located in a side valley to the west of Auxey-Duresses, in the direction of the communes and vineyards of the Hautes Côtes de Beaune. A little more than half of the production consists of white wine. 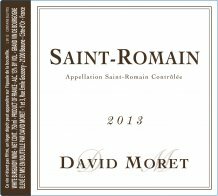 There are no Grand Cru and no Premier Cru vineyards within Saint Romain. Like liquid gold in the glass. A creamy and powerful Meursault, it drinks superbly now. Round and rich on the palate, with orchard fruit characters, it is lifted on the finish by good acidity. GRAPE VARIETIES: 100% Chardonnay REGION: Côte de Beaune CLASSIFICATION: AOC ALCOHOL: 13% Grapes were brought straight to the winery and were pressed immediately, to preserve the precious Chardonnay aromas and flavors. The wine went through alcoholic and malolactic fermentation in French oak barrels, and ageing, for a total of just over 12 months before being bottled and resting in cellars for approximately 6 months. 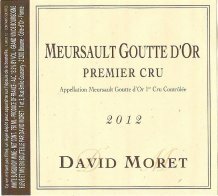 David only used 25% new French oak, to ensure that the fine character of his Meursault shines through. Les Narvaux is a lieu-dit vineyard next to Genevrières and Poruzots, has very shallow soils and a southerly aspect. The grapes were all handpicked into small boxes, which ensured the berries remained intact until arrival at the winery. Pale golden hues in the glass. With zesty citrus aromas, this Chardonnay is generous on the palate with spicy undertones and a lingering finish. Delicious and complex, it is difficult to find a white wine quite like it outside of Burgundy. Grapes were brought straight to the winery and were pressed immediately, to preserve the precious Chardonnay aromas and flavors. The wine went through alcoholic and malolactic fermentation and ageing in French oak barrels for a total of just over 12 months. After bottling the wine rested in cellars for approximately six months. David only used 25% new French oak, to ensure that the fine character of his wine shines through. 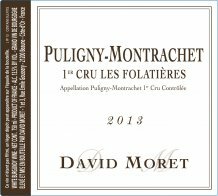 Grapes for the Puligny-Montrachet are grown on limestone and clay soils, producing wines that are round and appealing. Floral aromas and hints of white peach on the nose. On the palate, the wine is concentrated with lively acidity, fine, integrated oak and a creamy texture. 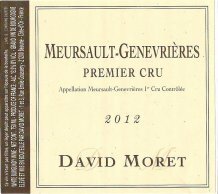 Meursault has 17 Premiers Crus, of which the highest-regarded are Les Charmesë, Les GenevriËresë and Les PerriËresë (many regard these three as the unofficial Grand Crus of Meursault). The 30 hectares of Les Charmes sits on the southern border with Puligny-Montrachet; the limestone and clay soils give wines which are round and appealing. The grapes were all handpicked into small boxes, which ensured the berries remained intact and healthy for their arrival at the winery. Grapes were brought straight to the winery and were pressed immediately, to preserve the precious Chardonnay aromas and flavors. The wine went through alcoholic and malolactic fermentation in French oak barrels and ageing, for 18 months before being bottled and resting in cellars for several months. David used 30% new French oak, to ensure that the fine character of his Meursault shines through. 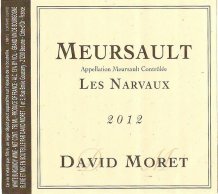 Made on a very limited volume, this is a great example of how exciting Meursault can be. A very balanced and rather elegant wine, it offers great balance between tropical fruit aromas and a poised acidity. A slight creaminess leaves a mouthwatering finish. GRAPE VARIETIES: 100% Chardonnay REGION: Côte de Beaune CLASSIFICATION: AOC ALCOHOL: 13.5% Meursault has 17 Premier Crus, of which the highest-regarded are Les Charmes, Les Genevrieres and Les Perrieres (many regard these as the unofficial Grand Crus of Meursault). The 16 ha of Les Genevrieres sit towards the south of Meursault; the name “Genevriere” literally means “Juniperí”, from the many Juniper bushes that lined the hills in the past. Soils here are extremely stony, and the aspect is southeasterly and therefore sunny, conferring intensity and richness in the wines. The grapes were all handpicked into small boxes, which ensured the berries remained intact and healthy for their arrival at the winery. Grapes were brought straight to the winery and were pressed immediately, to preserve the precious Chardonnay aromas and flavors. The wine went through alcoholic and malolactic fermentation in French oak barrels, and ageing, for 18 months before being bottled and resting in cellars for several months. David used 30% new French oak, to ensure that the fine character of his Meursault shines through. The color is a beautiful pale golden color with green highlights. The nose reveals notes of hazelnut and smoke. The palate is racy, fat powerfull and with much freshness. The finish is long and it is supported by a beautiful minerality. having a very classic flavor profile that is straight, firm and immensely long. This wine should improve with age onver the next few years. Pair it with pâté, freshwater fish, seafood and goat cheese. GRAPE VARIETIES: 100% Chardonnay REGION: Cote de Beaune CLASSIFICATION: AOC ALCOHOL: 13.5% Grapes were brought straight to the winery and were pressed immediately, to preserve the precious Chardonnay aromas and flavors. The wine went through alcoholic and malolactic fermentation in French oak barrels, and ageing, for 18 months before being bottled and resting in cellars for several months. David used 30% new French oak, to ensure that the fine character of his Meursault shines through. 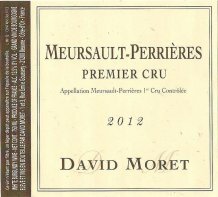 David Moret says that Premier Cru Les Perrierese can almost be considered as a Grand Cru, consistently producing concentrated wines that have the ability to age. A fragrant nose of lemons, white peach and green apples. The wine has wonderful minerality, mouthwatering acidity and superb concentration. GRAPE VARIETIES: 100% Chardonnay REGION: Cote de Beaune CLASSIFICATION: AOC ALCOHOL: 13.5% Grapes were brought straight to the winery and were pressed immediately, to preserve the precious Chardonnay aromas and flavors. The wine went through alcoholic and malolactic fermentation in French oak barrels, and ageing, for 18 months before being bottled and resting in cellars for several months. David used 30% new French oak, to ensure that the fine character of his Meursault shines through. 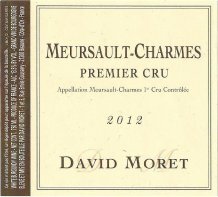 Meursault has 17 Premiers Crus, of which the highest-regarded are Les Charmes, Les Genevrieres and Les Perrieres (many regard these three as the unofficial Grand Crus of Meursault). The 16 hectares of Les Genevrieres sit towards the south of Meursault; the name Genevriere literally means Juniperí, from the many Juniper bushes that lined the hills in the past. Soils here are extremely stony, and the aspect is southeasterly and therefore sunny, conferring intensity and richness in the wines. The grapes were all handpicked into small boxes, which ensured the berries remained intact and healthy for their arrival at the winery. This is a superb Premier Cru. Supremely fine and elegant with wonderful minerality and fruit levels. The palate is creamy, with lovely acidity and great fruit intensity and the finish is long and persistent. Grapes were brought straight to the winery and were pressed immediately, to preserve the precious Chardonnay aromas and flavors. Using natural yeasts, the wine went through alcoholic and malolactic fermentation in French oak barrels. The wine was then aged for 12 months in oak, of which 40% was new, before being bottled and resting in cellars for several months. 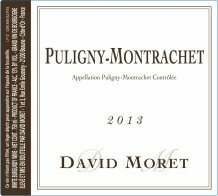 Puligny-Montrachet is devoted almost exclusively to the production of Chardonnay. Soils here are generally extremely thin with good levels of limestone, producing wines that are round, elegant and appealing. At 16 hectares, ‘Les Folatières‘ is the largest 1er Cru in Puligny and shares a similar altitude and soil composition as Grand Cru Chevalier Montrachet. The flagship of David Moret, Corton Charlemagne, a myth, so dense, so buttery, so lush and fruity, soft and at the same time possessing phenomenal minerality. A complexity that has no equal. With enormous depth in the glass. In the mouth very round, ripe and dense.